U.S. Secretary of State Mike Pompeo on Wednesday claimed Turkish military action in Syria would have "devastating" results as he met in Washington with Foreign Minister Mevlüt Çavusoğlu. "Secretary Pompeo expressed support for ongoing negotiations regarding northeast Syria, while warning of the potentially devastating consequences of unilateral Turkish military action in the region," the State Department said in a statement after their talks. Turkey has been saying it could carry out another cross-border operation into Syria to rid the region east of the Euphrates River of terrorists. Despite Ankara long-voiced objections, the U.S. has provided ongoing support to the Syrian Democratic Forces (SDF), which heavily consists of PKK-affiliated People's Protection Units (YPG). Turkey maintains that it has the right under international law to defend against from threats to national security, including the danger posed by a "terror corridor" in northern Syria. Turkey carried out two cross-border operations in northern Syria, Operation Euphrates Shield launched in August 2016 and Operation Olive Branch in January 2018, to drive terrorist groups, including the YPG and Daesh, away from its borders. Çavusoğlu said earlier on Wednesday that the U.S. lacked a "clear strategy" in Syria, with different positions coming from various parts of the government. "Different positions, different statements are coming from institutions and departments here in the United States. State Department and Defense ministry, as well as the military on the ground, CENTCOM, and this and that. All different positions," he said at a panel organized by the Atlantic Council titled "Turkey's Role in NATO and Regional Security Challenges" in Washington D.C., where foreign ministers of NATO members came together for the 70th anniversary of the security bloc. "There is no clear strategy, this is the problem," he emphasized. 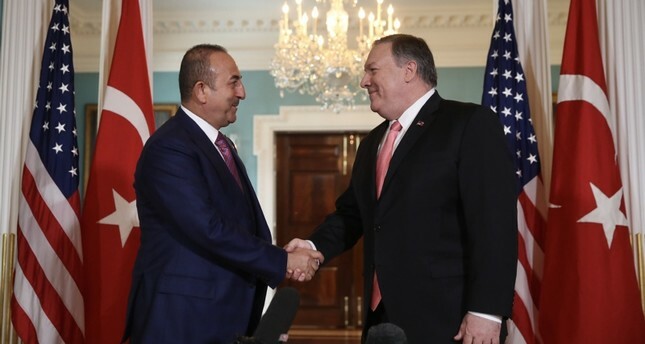 Pompeo and Çavusoğlu's meeting came hours after U.S. Vice President Mike Pence remarked that Turkey's purchase of the Russian S-400 anti-missile system, which Washington considers a threat to U.S. military equipment, would threaten the relationship between the NATO allies. But Çavuşoğlu underlined at the panel on Wednesday that Ankara does not have to choose between Russia and its NATO allies. "The purchase from Russia is a done deal," Çavuşoğlu said at the NATO panel. "We are not choosing between Russia and any other allies… We don't see our relations with Russia as an alternative to our relations with others. And nobody, neither West nor Russia, should or can ask us to choose," he said. The minister said Turkey has proposed to the United States that they form a technical working group to determine that Russian S-400 missile defense systems do not pose a threat to U.S. or NATO military equipment. Turkey's foreign minister arrived in Washington the same week the U.S. announced it would suspend all "deliveries and activities" related to Turkey's procurement of F-35 jets because of Ankara's plans to purchase Russia's S-400 surface-to-air missile system. A Pentagon official said later Tuesday that Turkish pilots will continue to train with F-35 fighter jets in Arizona.